If you’re in Hilo you might notice there’s a certain excitement in the air. People are busy with preparations, double checking their to-do lists, and getting ready for the big event. No, we’re not talking about the spectacular free July 4th fireworks display that takes place at Hilo Bayfront at 8p.m. on Friday. We’re talking about the mouth watering, finger-licking, lip-smacking seventh annual Hilo Bay BBQ Cook-off that runs July 3-4 in downtown Hilo. Due to road construction, this year’s event will be held at the soccer fields on the mauka (or mountain) side of Kamehameha Avenue. Over the course of two days, 10 teams will showcase their best examples of pork spare ribs, pork, chicken, chili, brisket, and poke. Trophies are awarded for the top three winners in the barbeque beef, brisket, chicken, pork, and chili categories. Sanctioned by the International Barbeque Cookers Association, the event serves as the Hawaii State BBQ Championship and winners are eligible for a spot in the renowned Jack Daniel’s Invitational. 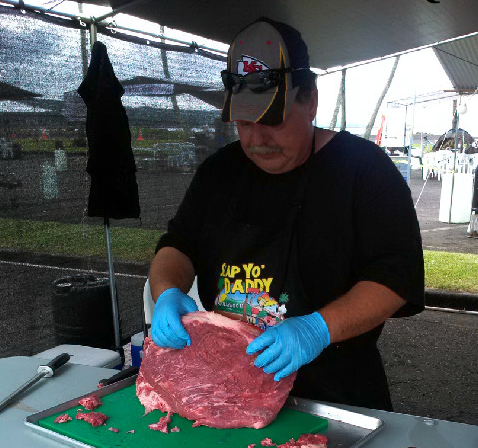 With bragging rights, trophies, and the possibility of appearing in a national competition on the line, the Hilo Bay BBQ Cook-off attracts pit masters from across the state and the mainland. My husband and I are huge fans of this event and attend every year. The food is absolutely fantastic! And it takes a lot to impress us. In addition to selling real estate, I created and sold five restaurants in California before moving to the Big Island more than 20 years ago. One of the reasons my husband and I so very much enjoy the Hilo Bay BBQ Cook-off is the laid back feel of the event and the sense of aloha. Yes, the food is absolutely incredible. (My mouth is watering as I type this just thinking about the brisket!) But we also enjoy the atmosphere. 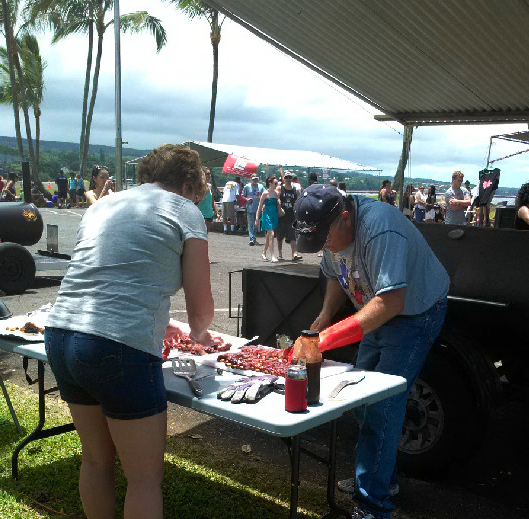 Teams from around the country participate in the Hilo Bay BBQ Cook-off. The pit masters and their teams are willing to talk story and answer your questions. Want to know what kind of local wood to use for your grill? Just ask. Some folks use ohia, others prefer kiawe, which is similar to mesquite, or strawberry guava (called waiwi in Hawaii.) Don’t expect the grill masters to share their secret sauce or recipe with you, but they are a friendly bunch and are happy to offer tips on seasoning, smoking, or grilling. The chili competition judging starts at 3 p.m.
Poke judging starts at 4 p.m.
Pork spare ribs at 1 p.m.
Pork competition at 2 p.m.
Brisket judging at 3 p.m. Team One Two BBQ trimming his brisket at a previous Hilo Bay BBQ Cook-off. After the BBQ, stroll around downtown Hilo or enjoy the free Fourth of July concert by the Hawaii County Band at the nearby Mo‘oheau Bandstand that gets underway at 7 p.m. and stay for the fireworks display at 8 p.m.
Tasty events like the Hilo Bay BBQ Cook-off are one of the many wonderful aspects to living in east Hawaii. From my ohana to yours, we wish you a happy and delicious Fourth of July! 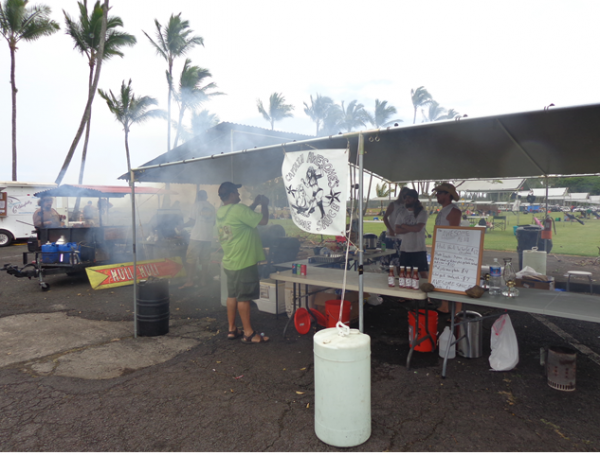 For more information on the Hilo Bay BBQ Cook-off, call Rick Fredricks, (808) 935-1860. If you’d like information on living in Hilo or other areas in east Hawaii, give me a call today at (808) 937-7246 or email me.